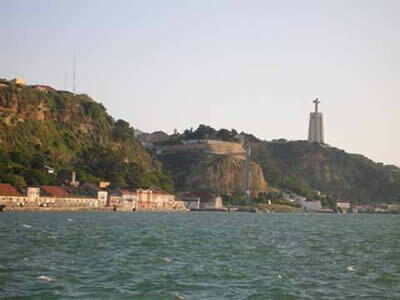 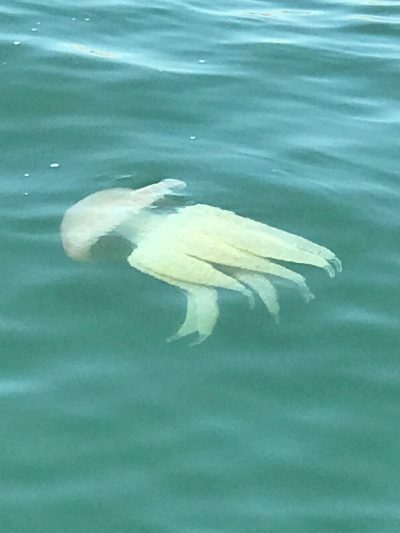 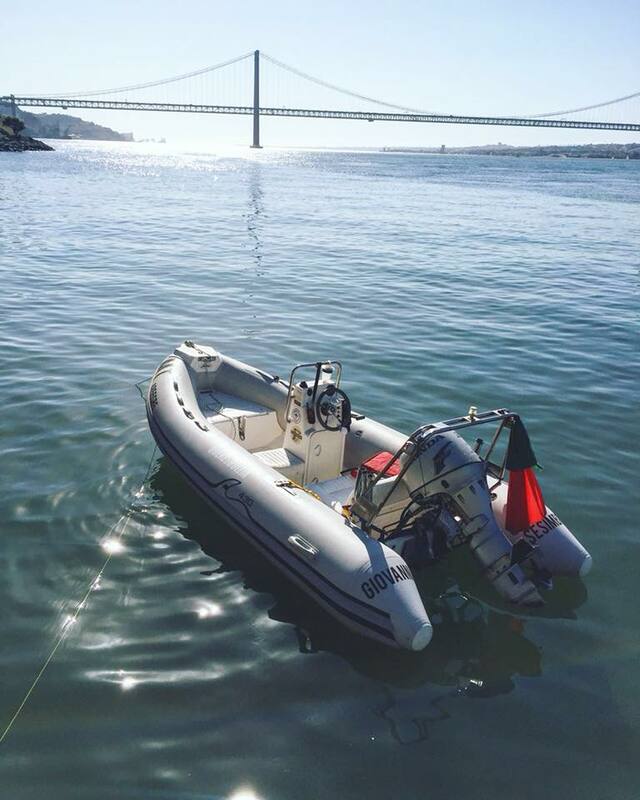 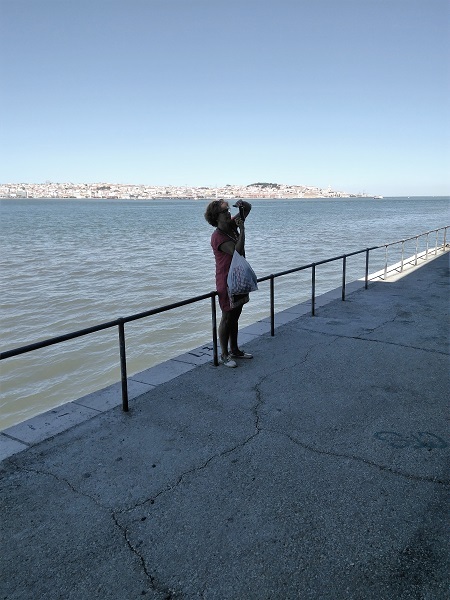 If you visit Lisbon for a few days, a 10-minutes ferry trip to the other side of the Tagus river is really worth it. 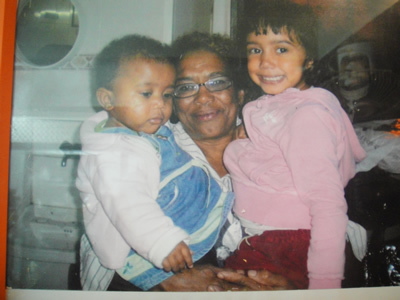 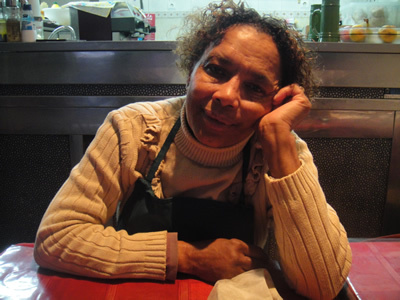 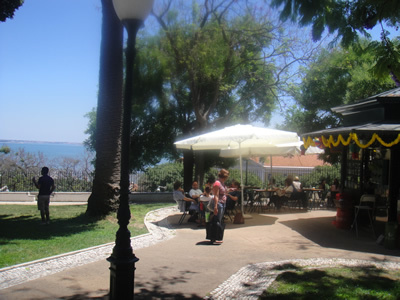 Restaurant Atira-te ao Rio is one of my favorites! 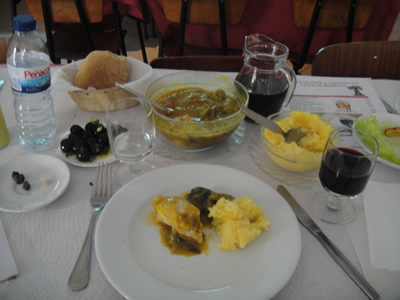 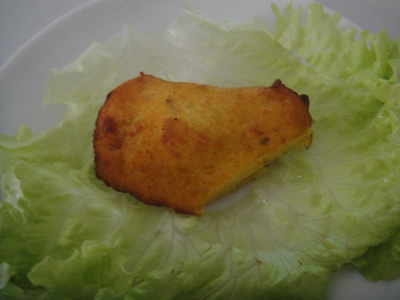 The menu is typically Portuguese: dishes with good presentation and tasty. 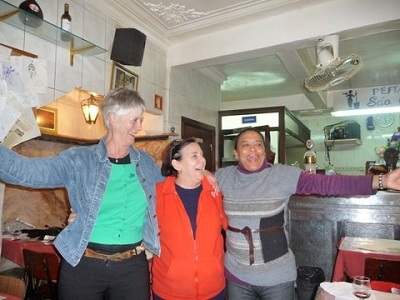 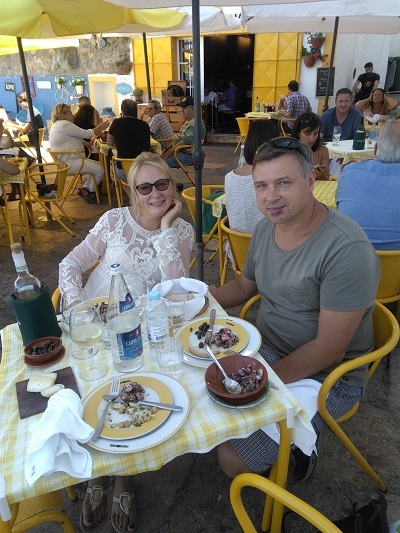 We ordered my favorite dish in this restaurant: salada com polvo grelhado (octopus salad), cous-cous com legumes e iogurt (cous-cous with vegetables and yoghurt), and cool white wine (copo de vinho branco). 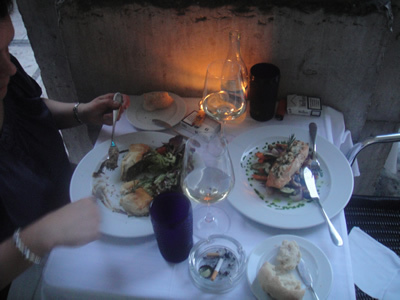 Bill for 2 persons: 35 euro. 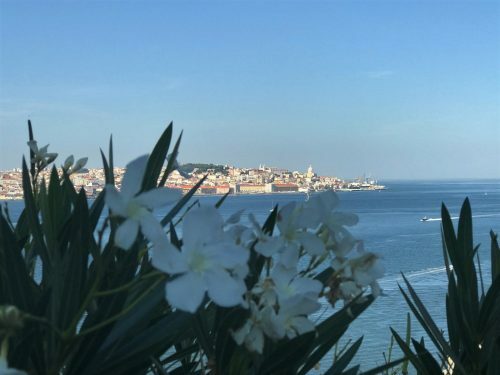 These pictures are made in September on a beautiful sunny day, but in wintertime there’s also the possibility to enjoy the views of old town Lisbon inside . 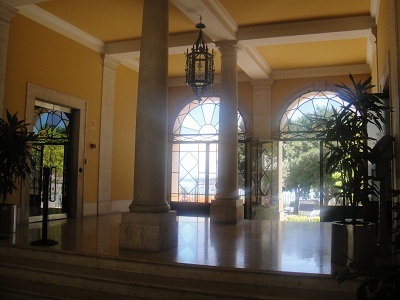 In wintertime the large windows allow the view to be equally (almost as) good as outside. 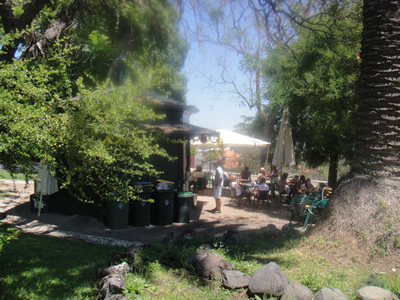 The restaurant features an indoor room with a burning stove and a terrace with heaters and blankets. 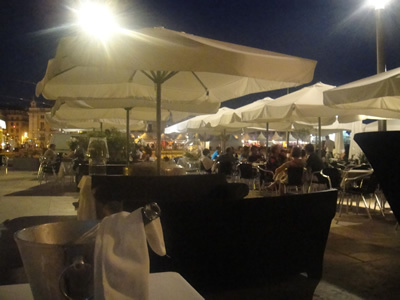 Although on Facebook there are some negative posts about this restaurant, my experience so far is very good ! 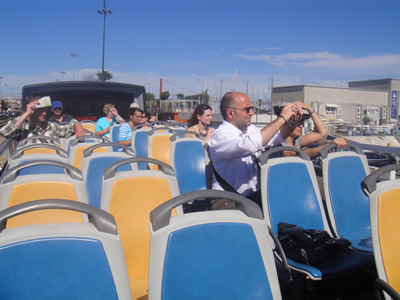 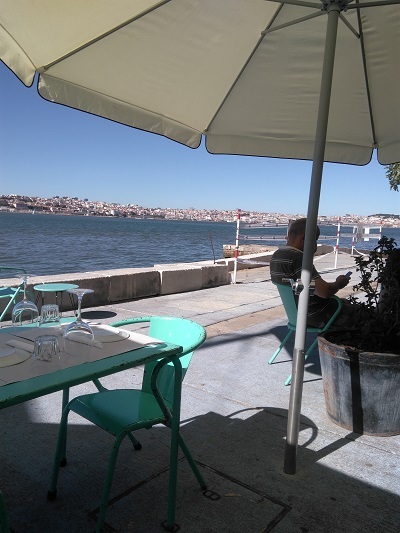 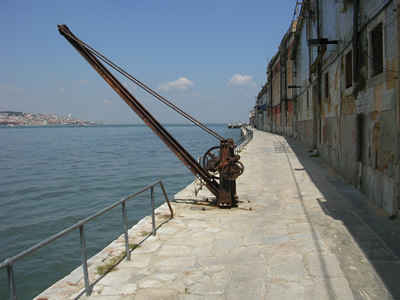 Take a (cheap) ferry trip from the Cais do Sodré ferry terminal to Cacilhas, (timetable vice verca) and after a 20 minutes walk along abadonded warehouses near the river Tagus there’s restaurant Atira-te ao Rio. 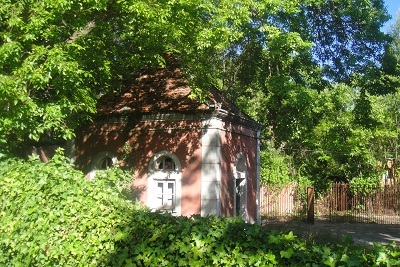 CLOSED? 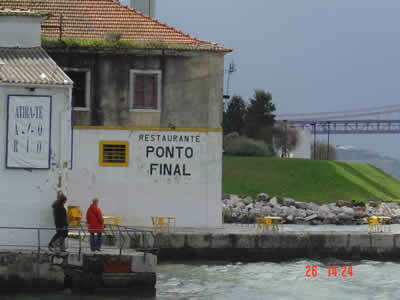 Nearby restaurant Ponto Final. 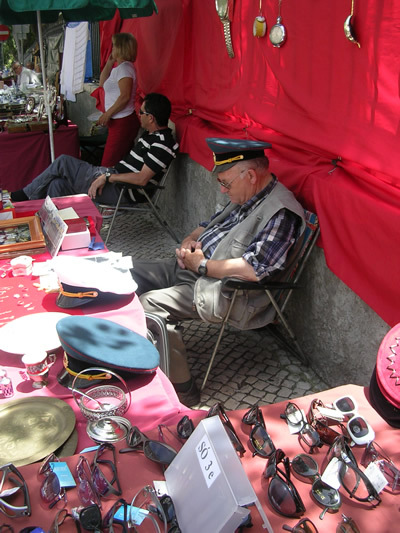 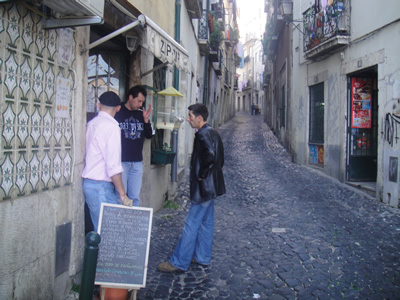 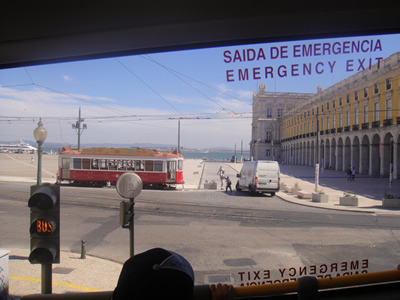 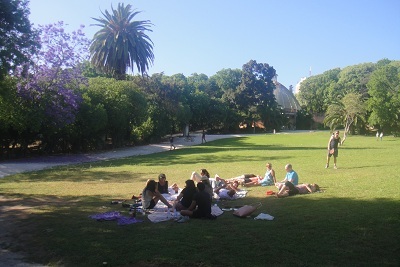 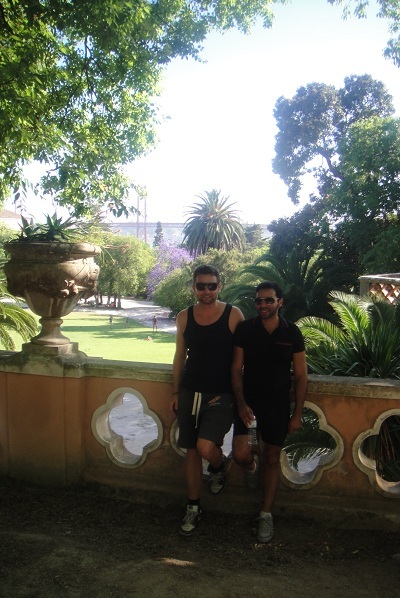 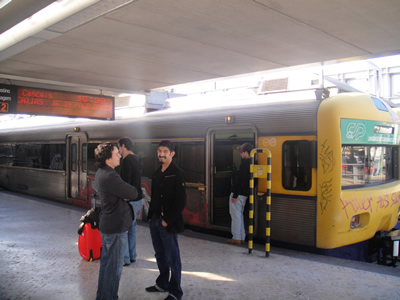 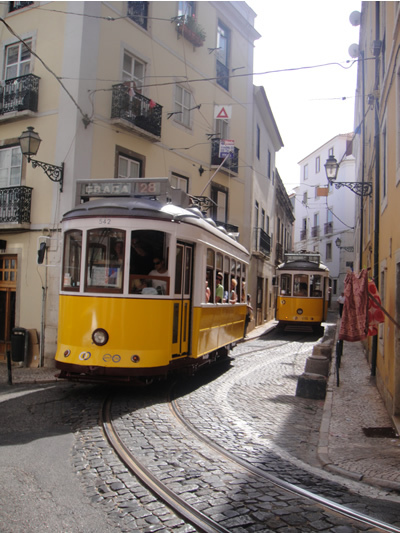 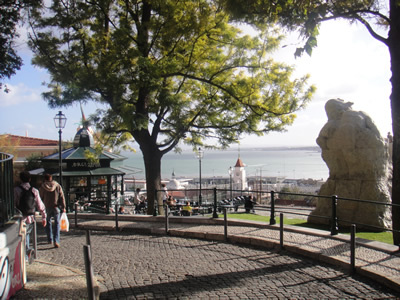 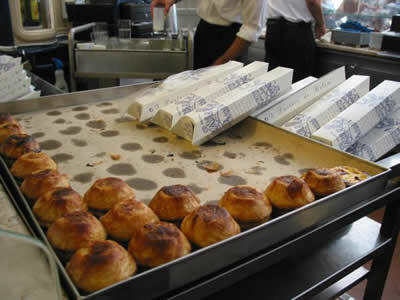 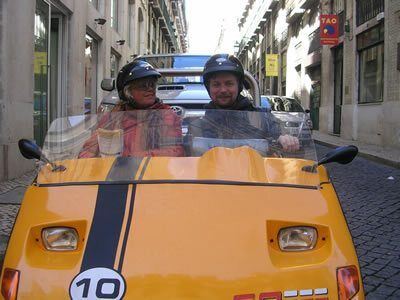 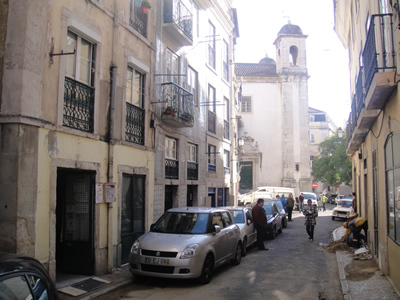 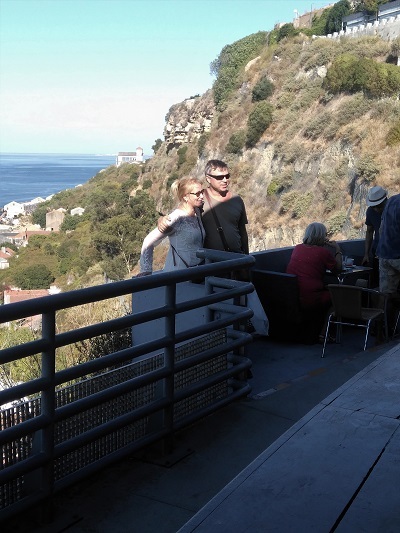 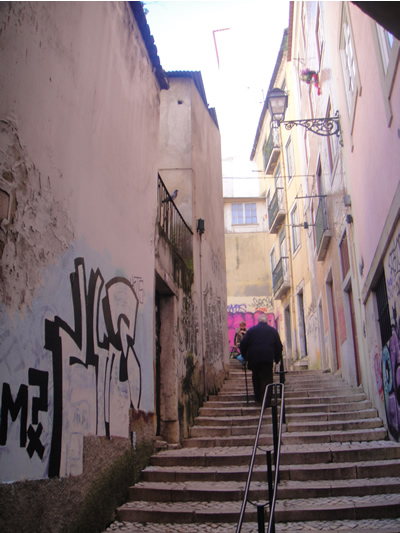 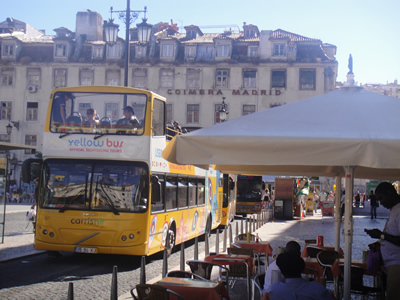 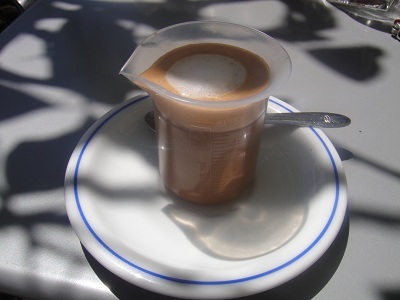 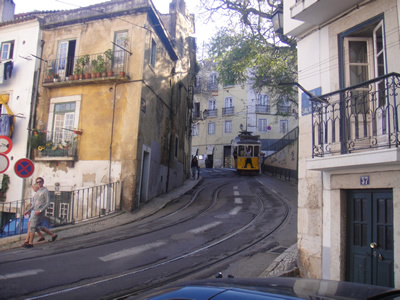 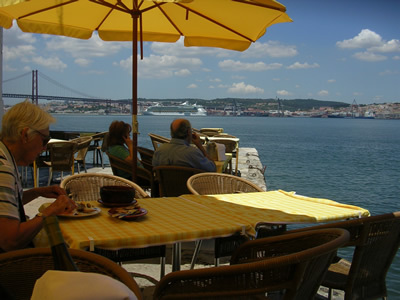 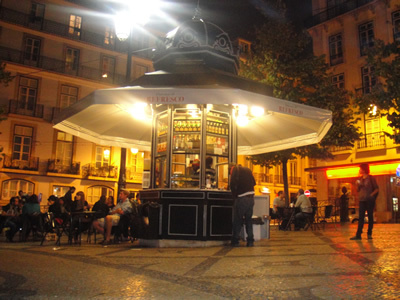 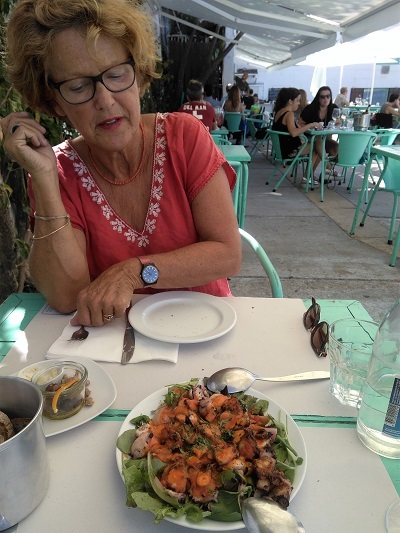 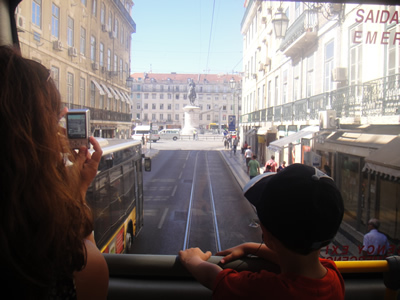 More…..
Lisbon is well known for its good food and beautiful terraces. 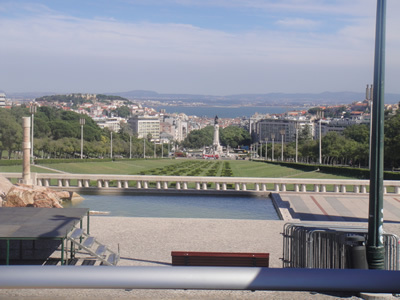 Praça do Comércio , facing the Tagus river and surrounded by the most stunning architecture, is a magical meeting place for both its population and visitors. 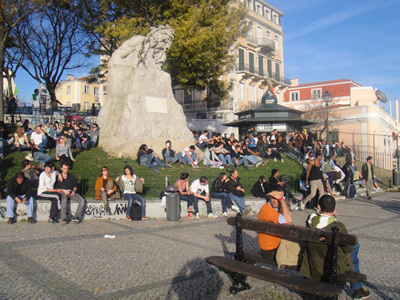 Terreiro do Paço (or Praça do Comerçio, Palace Square) is a favorite tourist place and one of the largest historical squares in Europe. 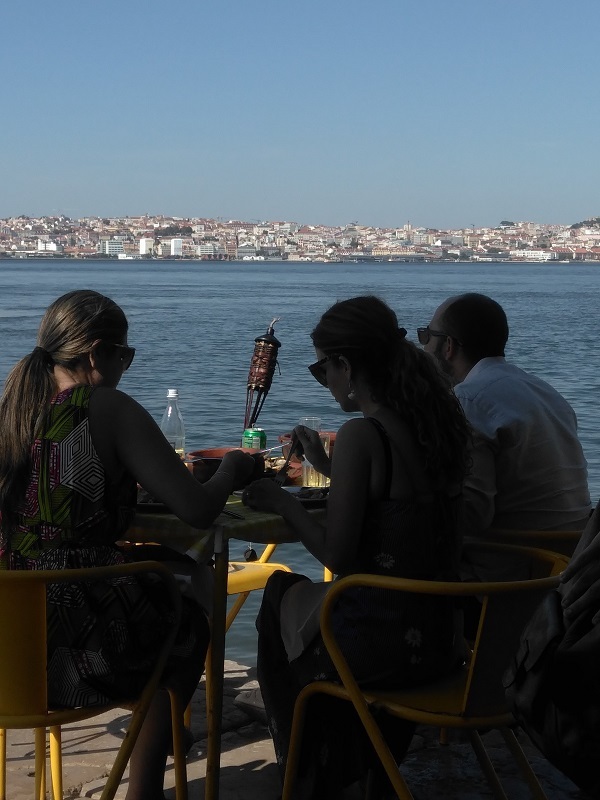 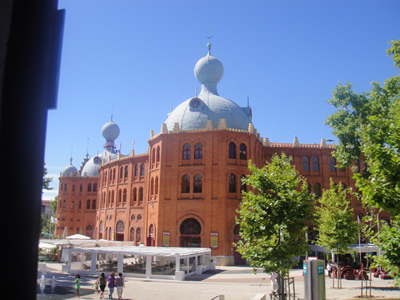 Now this monumental riverside square also offers a combination of cultural and culinary enjoyment, here you’ll find the Portuguese Tourist Office and besides it’s a wonderful location for events and exhibitions. 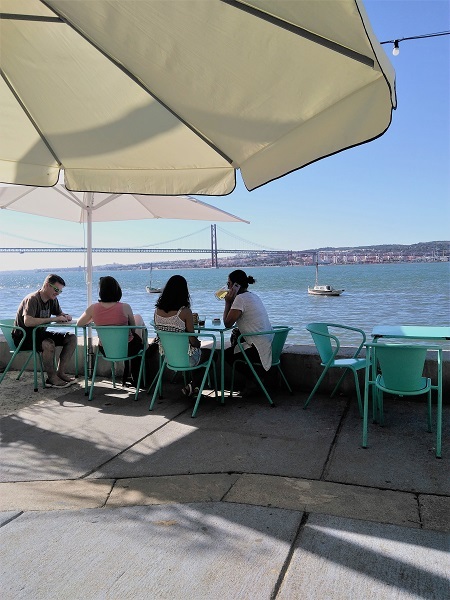 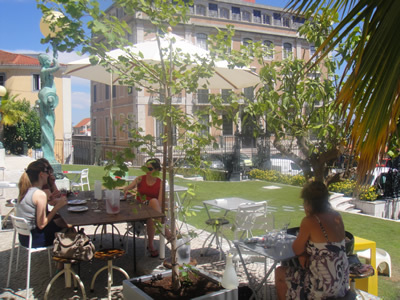 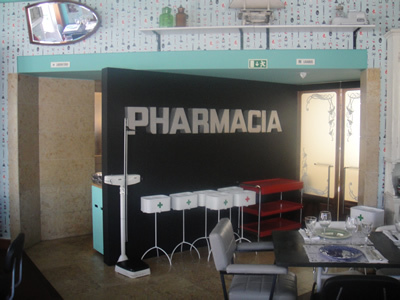 Integrated in Pátio da Galé , restaurant & lounge cafe Aura with it’s open air terrace is a very attractive place surrounded by the ‘ Palace Square’ in Lisbon. 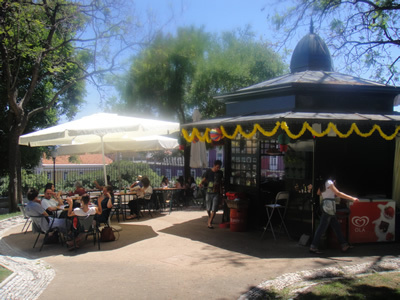 It has a glamorous inside dining room, and a lounge area to enjoy a cocktail or a tasty gourmet snack (petiscos Portuguesas). 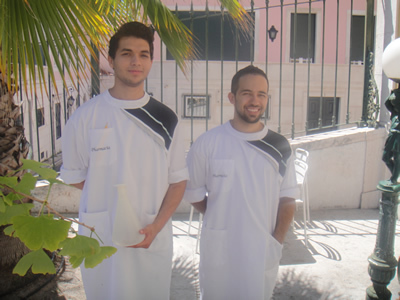 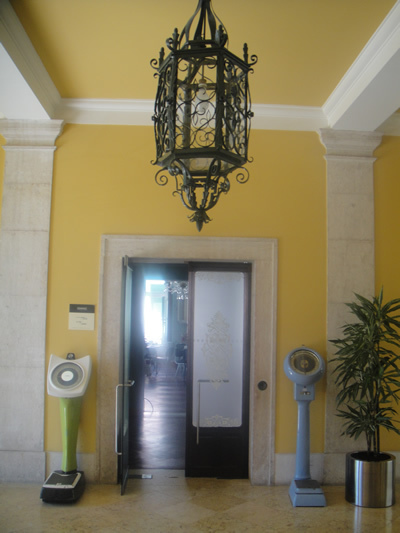 The Portuguese cuisine is prepared by Chef Matias Duarte and gourmet stylist Fabrice Marescaux. 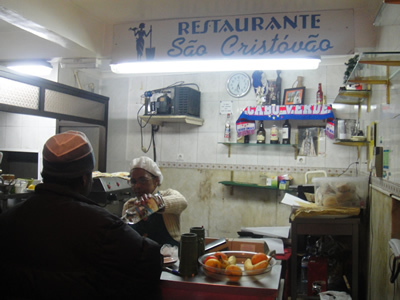 The menu is inspired by favorite dishes of the Portuguese people. 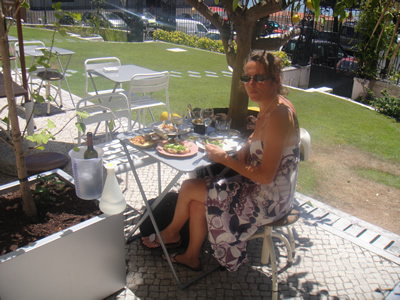 Our choice: salmão croustade de camarão (salmon crusted shrimp), pato (duck), salad, a small bottle of good Portuguese white wine, bread, 2 bicas (strong coffee) and 2 bottles of water. 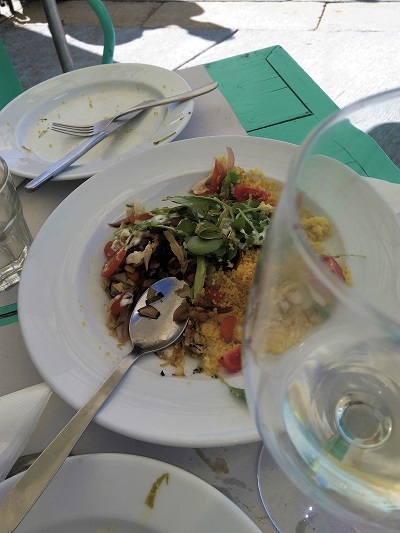 The bill came to around € 60. 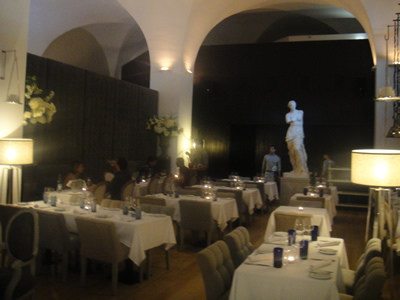 The inside dining room of restaurant Aura has an ‘aura of glamour’ . 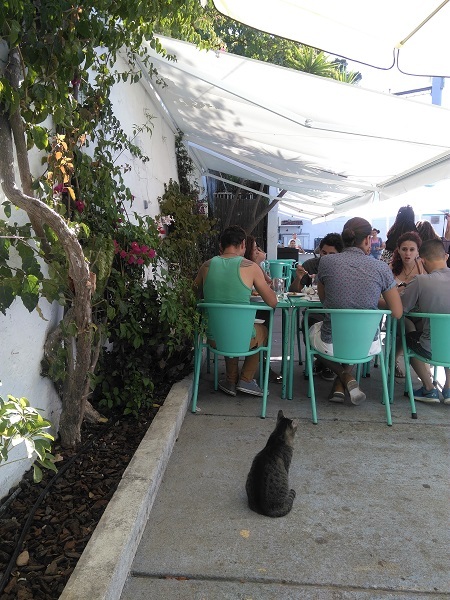 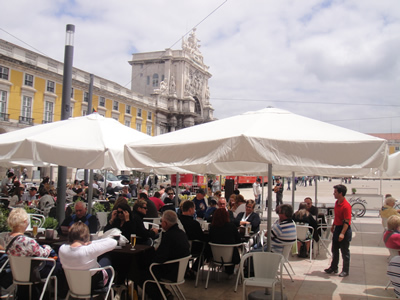 Most Portuguese people prefer to enjoy their lunch or dinner inside while the majority of tourists like to enjoy their dinner outside. 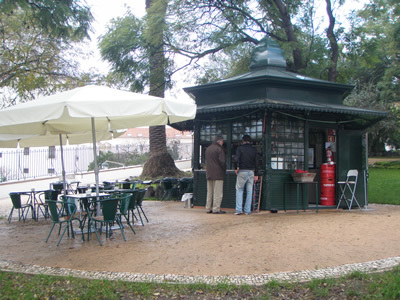 In case it’s too cold outside, this place is really worth a visit: delicious food in an elegant surrounding. 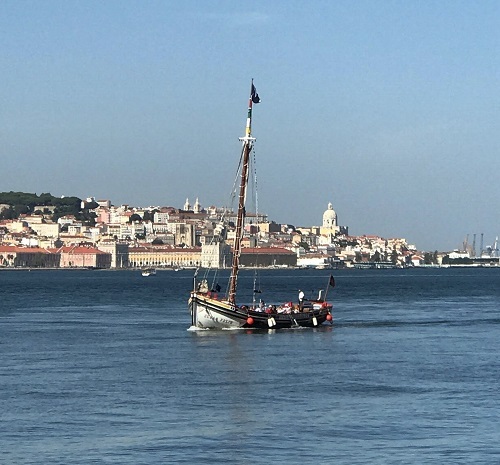 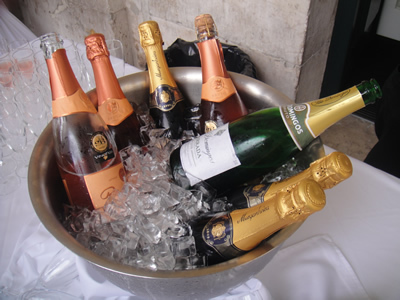 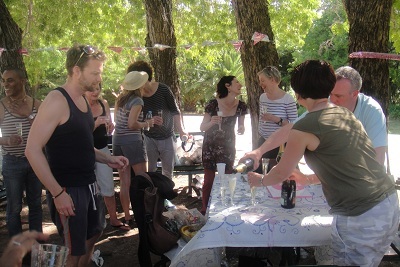 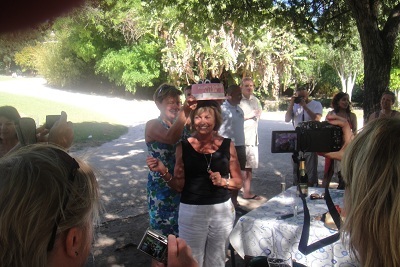 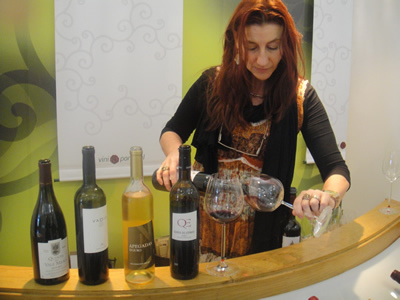 In June 2011, the ‘Apéritif à la française’ in Portugal (Lisbon and Porto), teamed up with Portuguese wines to toast just how well the two countries’ culinary traditions go together. 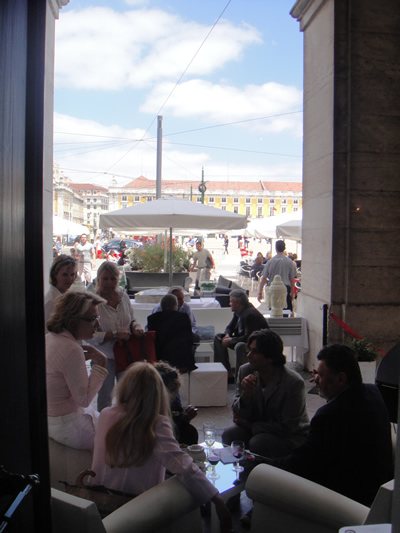 Journalists, industry professionals and opinion leaders enjoyed samplings of French products paired with a range of Portuguese wines in a lounge-style atmosphere. 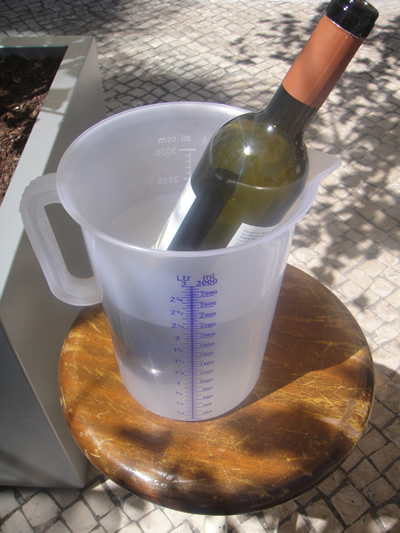 Are you a wine lover? 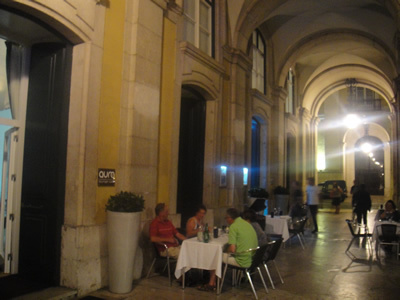 Just three minutes walk from restaurant Aura there’s ViniPortugal, where you can taste a few wines for free. 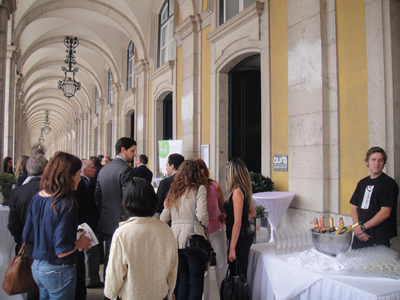 A very pleasant and interesting way to learn more about history and culture of Portuguese wines! 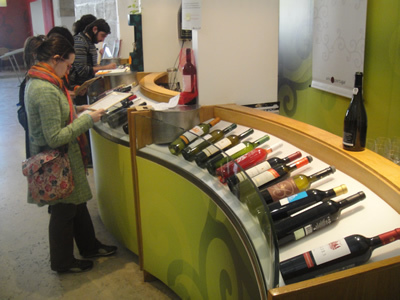 Some wines available for tasting can also be purchased and the very friendly and professional staff is always on hand to provide information of the wines currently available. 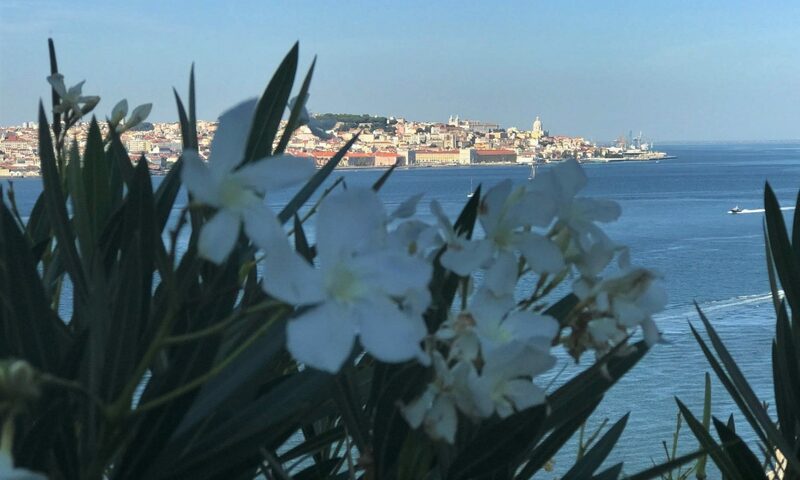 Right next to one of the most popular viewpoints (miradouros) ovoer the river Tagus (Tejo) in Lisbon Adamastor, you’ll find Palácio Verride, a former 18th- century Palace, better known as Palácio de Santa Catarina. 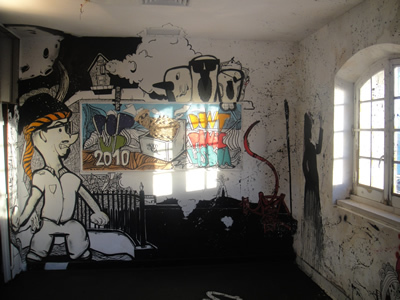 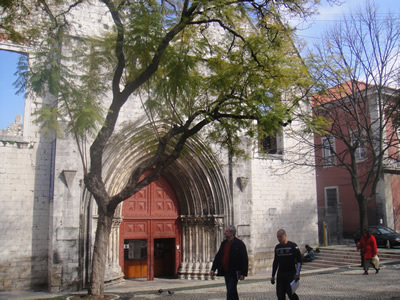 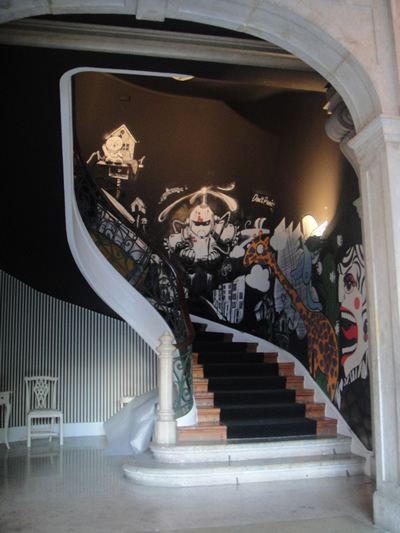 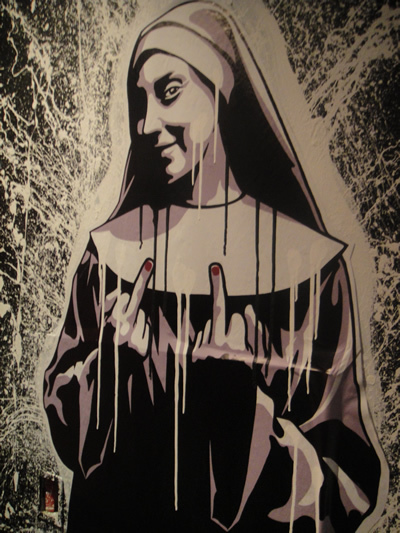 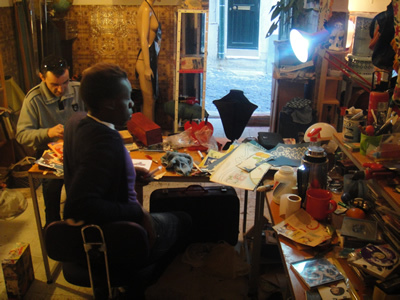 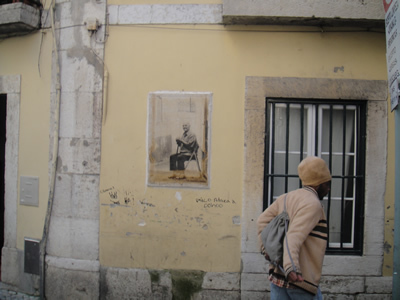 The municipality of Lisbon is the owner of the former Palace, and excellent art exhibitions are regularly held here, like in December 2010: ‘Pop Up’ Art Gallery, a urban culture international festival that challenges creators of multiple areas of artistic expression to intervene in vacant or abandoned urban spaces, giving them new life through art. 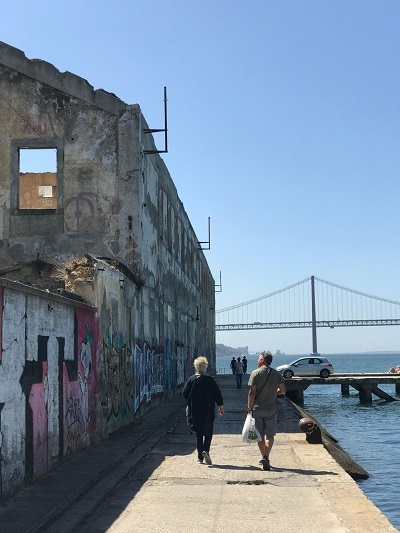 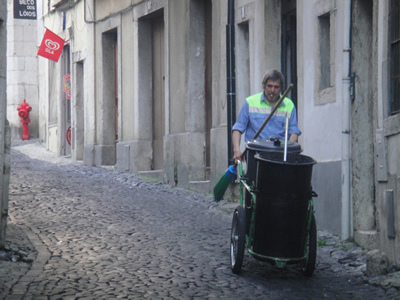 ‘Pop Up’ started in 2009 in Lisbon city, but intends to become an international platform of urban culture exchange, bringing together artists and talents from different cities around the world, aiming to promote Lisbon cultural identity in and out of doors. 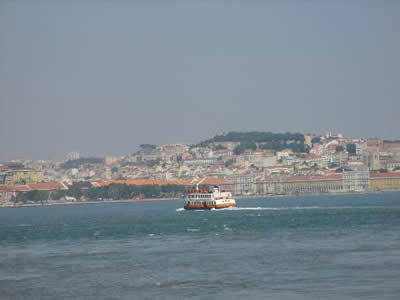 Palace Verride (known as Santa Catarina) Palace Lisbon. 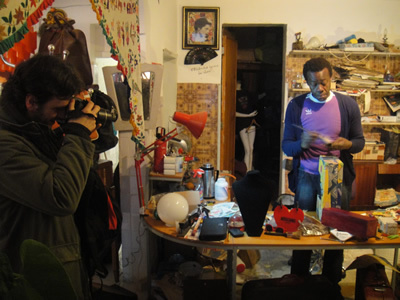 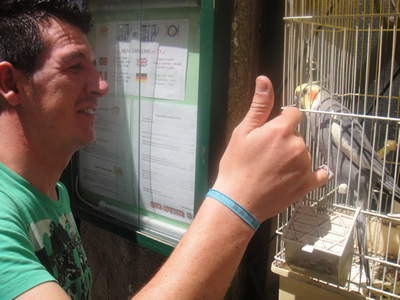 This year, ‘Pop Up’ had “Urban Nomads” for a theme and pigeons as their icon. 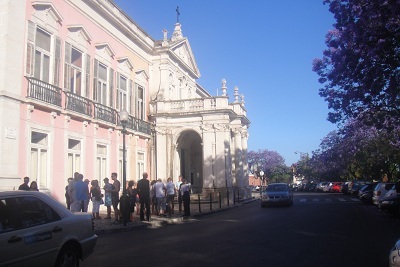 The 18th- century Santa Catarina Palace’s history dates back to the first half of the 18th century. 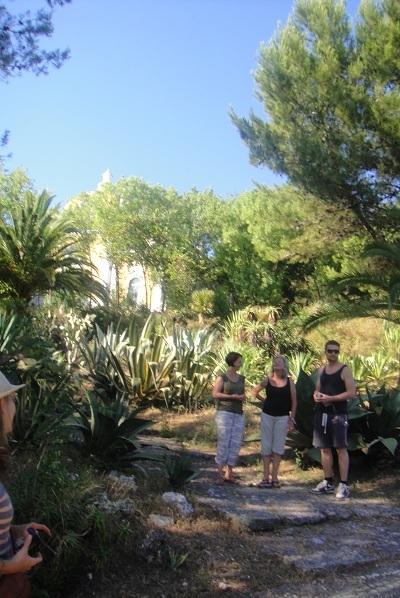 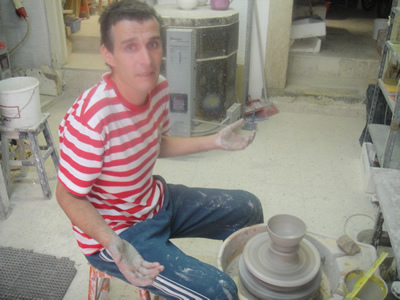 The Palace has seen various uses, a number of different owners and successive work campaigns. 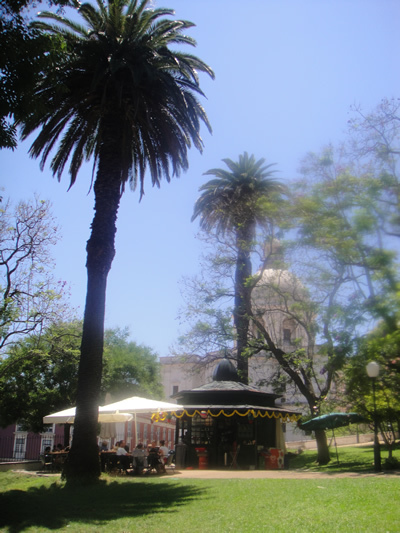 The Baron and Viscount of Moledos, Francisco de Paula Silva Tovar, deputy to the constitutional courts, resided there in the 1820s. 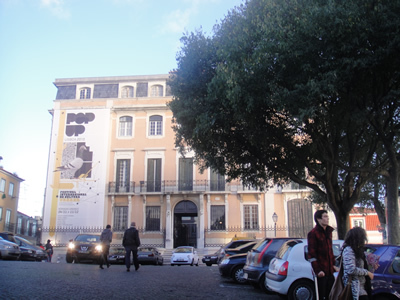 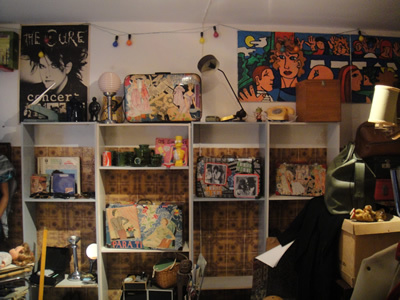 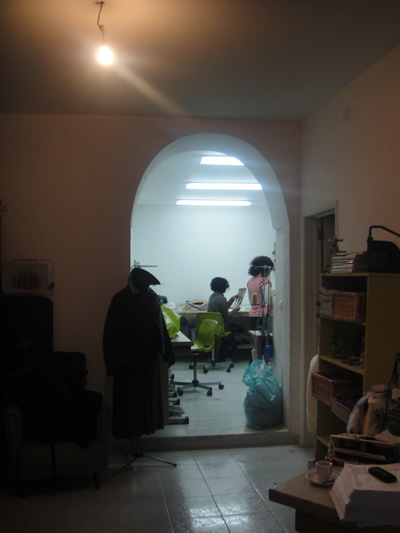 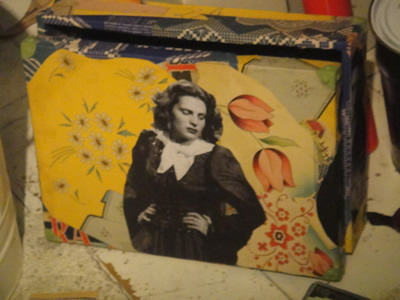 Recently the MUDE museum (art, design & fashion) housed here, nowadays located in Baixa area, really worth a visit! 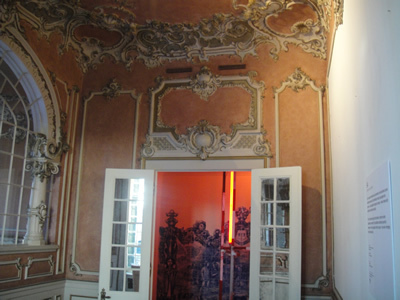 Happily many of the original rooms of the old Palace are still preserved, such as ornaments in the ceilings and beautiful tiles. 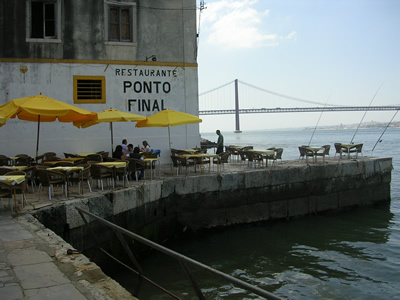 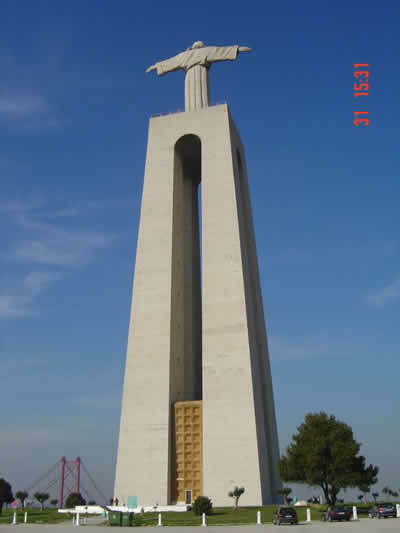 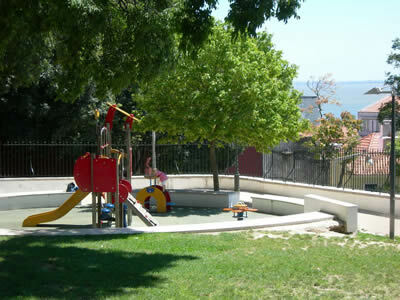 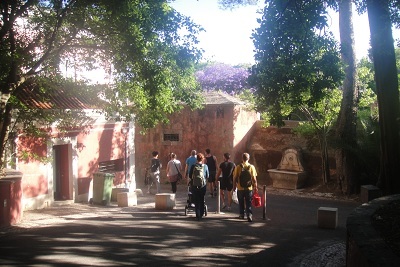 In the 1980s, the well-known architect and painter João de Almeida, made several changes. 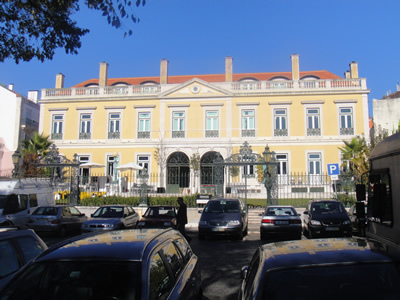 The Lisbon City Council purchased the palace in 2003. 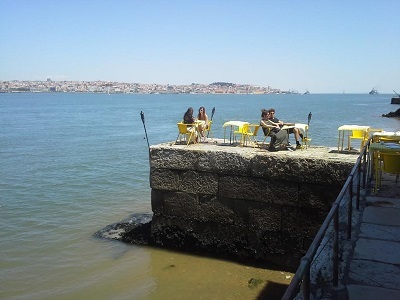 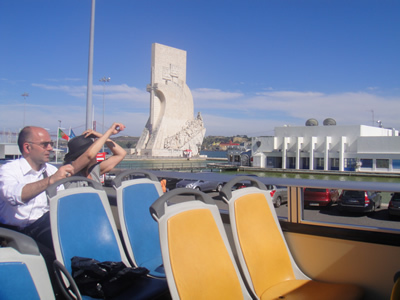 Popular river Tagus viewpoint right next to the Santa Catarina Palace: Adamastor viewpoint and Moorish kiosk (quiosque) cafe. 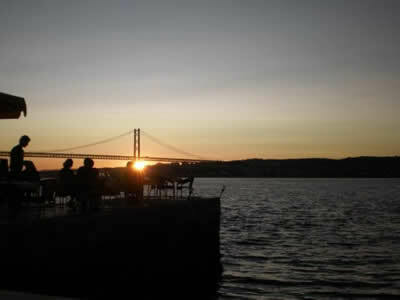 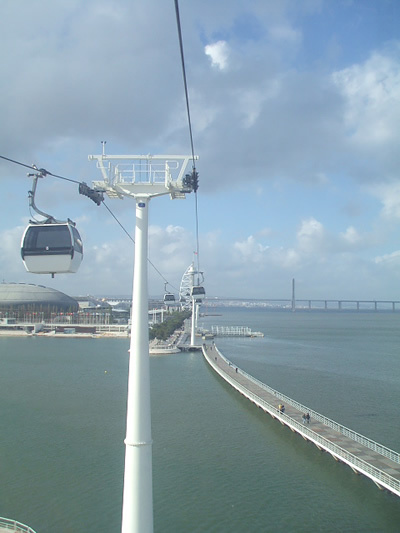 ‘Adamastor’ is a popular viewpoint (miradouro) and gathering place in Lisbon ovelooking the river Tagus, which is officially called the Miradouro de Santa Catarina.